Records from the hill called Cabranosa in Sagres, Portugal. All records are my own* due to timings of arrival. Arriving late afternoon. No migrant raptors. 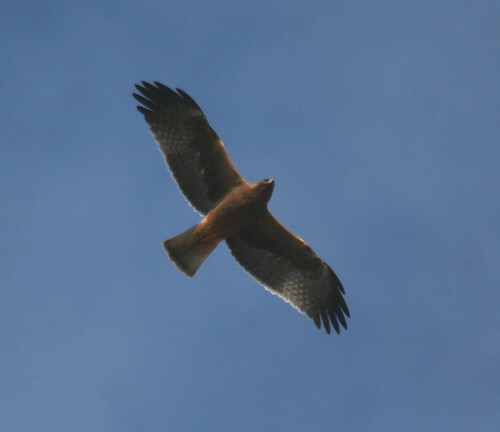 1 Black Kite, 2 Peregrine and 3 Kestrel. 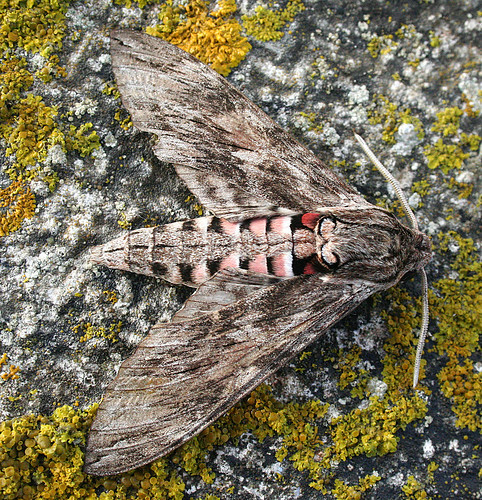 Also Ringed Plover, Hoopoe, and Death’s Head Hawk-moth larvae. A little better, though raptor migration is very slow. 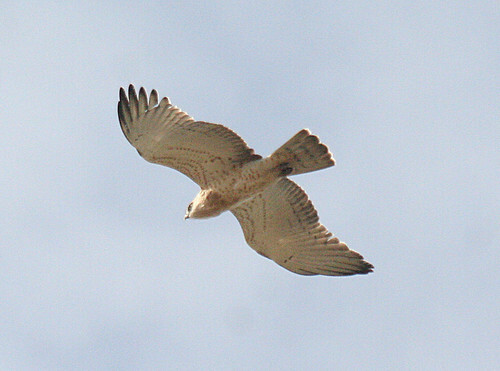 4-6 Short-toed Eagle, 9-13 Booted Eagle, 5 Sparrowhawk, 1 Black Kite, 6+ Kestrel. Also 2 Raven and local Chough flock to roost. 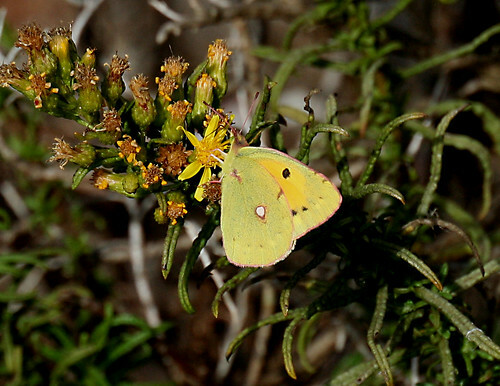 Clouded Yellow one of the few butterflies moving at the moment. 57 Booted Eagle and 1 Black Kite. Noticeable increase of Booted Eagle arriving in the Sagres Peninsula, but otherwise very quiet on a day which saw several heavy showers covering a wide area. Heavy rain all day. No raptor recording took place. 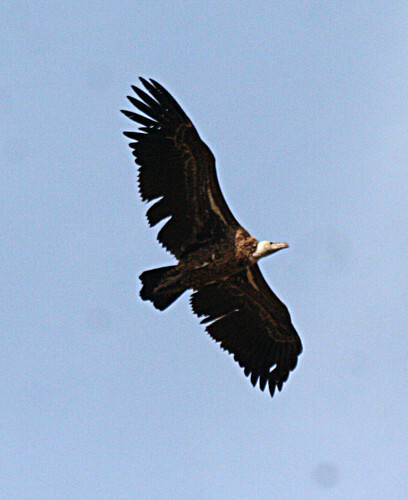 52-70 Booted Eagle, 2 Black Kite, 5 Short-toed Eagle, 1 Honey Buzzard, 1 Buzzard. Some new Booted Eagles into the peninsula today, also a Golden Eagle in but didn’t make it to Sagres, remaining to the north of the area. Hopefully the first of a selection of birds arriving. Its very quiet at the moment – but it is migration, this is how it works. Rain and thunderstorms dominated the day from around 9.00am with weather from the east making going out impossible. Clearing by mid-afternoon and then new storms coming in from the west. Tomorrow may be a washout, then just a case of seeing how long these weather systems linger before good weather arrives. Few birds from Cabranosa late afternoon. Several Booted Eagle were around, including perhaps 5+ new arrivals drifting in. Also a Honey Buzzard which was maybe different to yesterday’s bird with a very pale rump area. 2 Short-toed Eagle and one Kestrel. Howling wind – with occasional heavy showers. No birding. Another cloudy day with rain on and off. 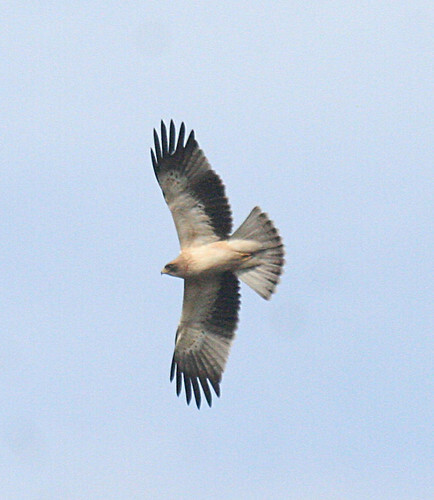 3 Booted Eagle sat in trees viewable from Cabranosa, with several Spotted and Pied Flycatchers in the immediate area. Seawatching from 13.30-18.30 from Cape St Vincent produced: Shag – 1 south + several blogging, 1392 Gannet south, 60+ Cory’s Shearwater bloggin + 6 east, 4 Great Shearwater east, 42 Balearic Shearwater south, 2 Sooty Shearwater south, 45 Great Skua south, 20 Arctic Skua south, 3 Pomarine Skua south, 1 Audouin’s Gull south, 7 Lesser Black-backed south, 37 Sandwich Tern south, 1 Common Tern south, 20+ sterna sp south. Only present from 14-00-18.00 on Cabranosa. 20-40 Booted Eagle, 3 Short-toed Eagle, 1 Hen Harrier and one Sparrowhawk. Another quiet period on Cabranosa. 1 Osprey, 33-42 Booted Eagle, 5 Short-toed Eagle, 2 Black Kite, 2-4 Kestrel. Also 30+ Woodlark in the immediate area. Finally, some sunshine, and some new birds! 2 Black Stork, 1-2 Osprey, 29-38 Booted Eagle, 18-25 Short-toed Eagle, 1 Buzzard, 2 Black Kite, 2 Sparrowhawk, 3-6 Kestrel, 1 Merlin, 2 Raven. A Cirl Bunting appeared briefly on Cabranosa and 15+ Woodlark were in the immediate area. 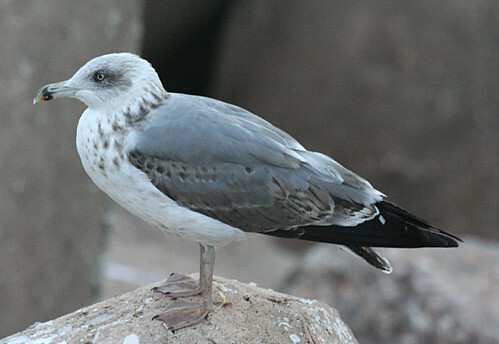 Yellow-legged Gull – Sagres harbour. A quieter day, with some birds leaving the bottleneck. 2 Black Stork, 1 Osprey, 19-22 Booted Eagle, 12-22 Short-toed Eagle, 2 Black Kite, 2+ Sparrowhawk, 1 Peregrine, 1 Merlin, 3 Kestrel, 2 Raven. The Pintail remained at Martinhal, viewed on the sea off the bar, while 1 Green Sandpiper, 1 Common Sandpiper and 9 Kentish Plover were on the lagoon, while 5 Spoonbill appeared almost at last night, and probably roosted. One of many Death’s Head Hawk-moth caterpillars. A change of wind direction saw some birds move into the peninsula, a sign of better things to come. 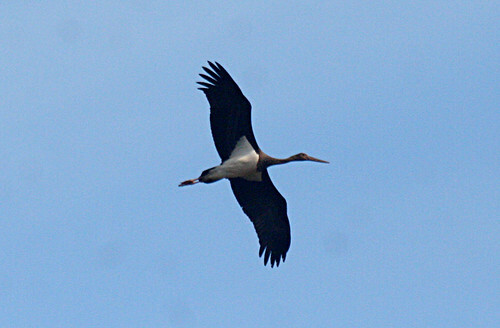 10 Black Stork, 18+ Booted Eagle, 10+ Short-toed Eagle, 2 Black Kite, 1 Sparrowhawk, 1 Peregrine, 3 Kestrel, 2-3 Raven. Also 6 Woodlark and a noticeable increase in Crag Martin number. 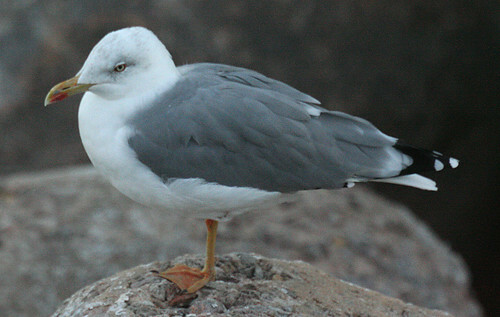 Favourable winds saw a good number of birds enter the recording area, with plenty of birds making their way to Sagres. 17 Black Stork, 2 Egyptian Vulture, c200 Griffon Vulture, 1 Ruppell’s Vulture, 24 Booted Eagle, 13 Short-toed Eagle, 3 Marsh Harrier, 1 Buzzard, 1 Black Kite, 1+ Sparrowhawk, 1 Peregrine, 1 Merlin, 4+ Kestrel, 2 Raven. 7 Woodlarks remained close to Cabranosa, and there was a noticeable movement of Wagtails with 36+ flava, 2 Grey Wagtail and 7 White Wagtail moving NW late on. Cabranosa magic – winds prevented the Griffon flock leaving the SW tip of the peninsula, which meant several hours with plenty of birds low in the sky. 15 Black Stork, 3 Egyptian Vulture, c300-320 Griffon Vulture, 3 Ruppell’s Vulture, 20+ Booted Eagle, 16-20 Short-toed Eagle, 1 Black Kite, 1 Peregrine, 1 Hobby, 1 Merlin, 4+ Kestrel, 1 Raven. 4 Grey Heron flew south west late pm. 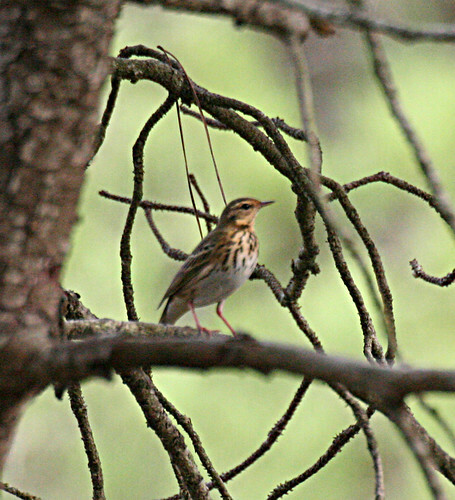 A Richard’s Pipit flew west over Lagos around 01.00 with thrushes and small numbers of Meadow Pipits also noted. A quiet afternoon on Cabranosa as temperatures soared. 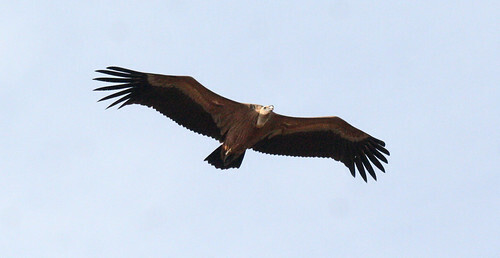 The main Griffon flock disappeared, taking with them many of the birds. 4 Egyptian Vulture, 18 Griffon Vulture, 9 Booted Eagle, 13 Short-toed Eagle, 1 Bonelli’s Eagle, 1 Honey Buzzard, 3 Hen Harrier, 2 Sparrowhawk, 1 Peregrine, 2-4 Kestrel. An Olive-backed Pipit and Yellow-browed Warbler were found in the immediate Cabranosa vicinity early morning, but searching during the afternoon only yielded a pipit sp, a Firecrest, Redstart and both Spotted and Pied Flycatcher, and 2 Pallid Swift were noted. The Olive-backed Pipit showed well late afternoon. The final day also featured the incredible spectacle of Red-veined Darter Sympetrum fonscolombii movement. Roughly 69,500 per minute were moving over 1km up to a height of 2 metres – or 300,000+ per minute across the same area up to a height of 10 metres! With many, many more above that. The sky was full of Sympetrum. * totals are personal sightings. An environmental consultancy company compiles daily records as part of a project which are more accurate than those listed here.